Site user Andrew pointed our way to this reading order in a comment on the feedback page. As he notes, there’s not much info posted about how it’s been put together – Erik over at forumlogr.com doesn’t include any introductory context – but it seems like it’s been researched. It’s separated nicely into little events or major story arcs, just in case you only want to pick up a piece. I hope so, because this is one of those things I was really into as a kid and have wanted to try again as an adult, see if it holds up. Some stuff I liked has (80’s Superman, and oh god, Swamp Thing) but other things have not. They have started collecting 2099 stuff in trade, but I have a feeling they won’t get around to all of it. This 90s extravaganza is in some ways similar to the latter Ultimate Universe, in that it ended up with many alternate versions of popular characters. Unlike the Ultimate Universe, created to give characters modern origins with less burden, the 2099 Universe was probably green lit mainly with a desire for “dark future cyber badass” versions of already popular characters. I remember thinking it really awesome that Doom got his own title right from the start, though. Anyway, without further ado, here’s the reading order! Valiant effort! One issue I noticed, though. 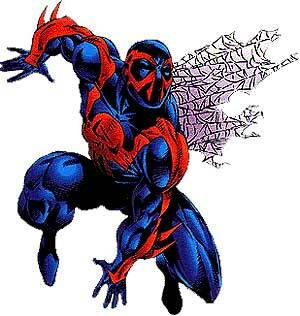 You have the Spider-Man 2099/Spider-Man cross over taking place right after Spider-Man 2099 #10, but the crossover depicts Gabriel (Spidey 2099’s brother) already knowing his brother is Spider-Man, which didn’t happen until some time in the late teens or twenties of that series. near the 2099 apocalypse there are a lot more that i have found that do not appear correct, such as in one of the x-men issues (i believe 23 or 24) they mention the gamma bomb and earthquake in California, however that does not happen until hulk #10 which is listed after the x-men issue that mentions it. Thanks a lot for pointing out this stuff. I didn’t compile the original list, but would be happy to try and make some corrections. I actually don’t have these books, so I can’t look up the exact ones. If you figure out where to place the Spider-Man crossover, and what shifts I should make with the x-men books, please let me know and I’ll update the list. I just finished reading all of the 2099 stuff and made a list of what I think the reading order should be. You want me to post the list on here or send it to you another way? Cool dude! A lot of corrections? You can post it here if you want and I’ll update the main post. If you already have it in a doc or something and don’t want to bother pasting, you could also email it to me. Up to you! It probably is still not perfect but I think it is better. I found out that the one above was missing a few issues and I added those back in. That’s a great idea. I’ve seen some beautifully self bound books before and I definitely think the material is worthy of the attention. I’d say you should read it through yourself (following the above reading order, perhaps – I’ve got to update the main post still) and then decide. Personally, I like books bound in a reading order, but you may feel it’s nicer to have just a spider-man book that you can read through in a go. Since you’ll have the material already, misewell look through it before making the final decision. I think I’m leaning towards series-centric books. We’ll see. But this reading order is invaluable to me. Thanks. Let us know how it goes. I’ve always been curious about the process.